Rent an Inflatable 13 Foot Photo Booth Snow Globe for your Corporate College Company Christmas Holiday Party or Winterfest event held in the MD DC VA area. 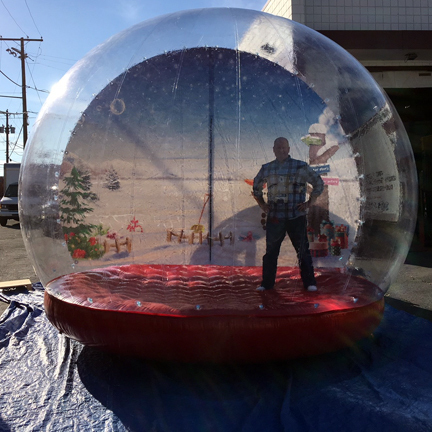 Inflatable Photo Snow Globe - Step inside our lifesize, 13 foot diameter Inflatable Snow Globe Photo Prop - a great attention-getter attraction and addition to any winter-themed special event. Snowman or Winter Lodge backdrops available. Measures approximately 15'w x 18'd x 12'h. Requires electricity (110 volt, 20 amps).